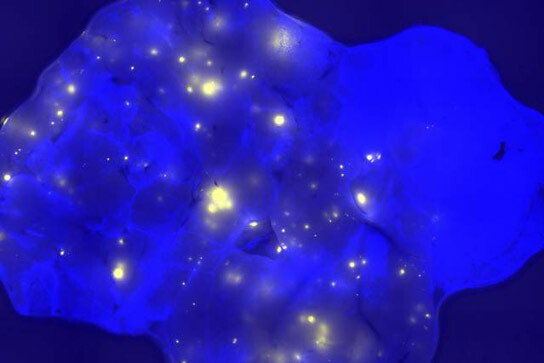 In this pancreatic tissue sample, bright spots represent cells that have undergone a specific genetic alteration. New research from MIT reveals a link between inflammation and cancer, showing that the timing of inflammation determines whether potentially cancerous mutations may arise. A new study from MIT reveals one reason why people who suffer from chronic inflammatory diseases such as colitis have a higher risk of mutations that cause cancer. The researchers also found that exposure to DNA-damaging chemicals after a bout of inflammation boosts these mutations even more, further increasing cancer risk. The findings confirm a longstanding theory about why inflammation and cancer are linked, and offer possible ways to help prevent and treat cancer, says Bevin Engelward, an MIT professor of biological engineering and senior author of a PLoS Genetics paper describing the findings. The paper’s lead author is former MIT postdoc Orsolya Kiraly. Other authors are postdoc Guanyu Gong, former postdoc Werner Olipitz, and Sureshkumar Muthupalani, chief of comparative biology in MIT’s Division of Comparative Medicine. Inflammatory diseases such as colitis, pancreatitis, and hepatitis have been linked to greater risk for cancer of the colon, pancreas, and liver. In these chronic inflammatory diseases, immune cells produce highly reactive molecules containing oxygen and nitrogen, which can damage DNA. Inflammation also stimulates cells to divide. Biologists had theorized that simultaneous DNA damage and cell division during inflammation could lead to cancer because dividing cells are more vulnerable to mutations caused by DNA damage. However, until recently it was difficult to test this hypothesis in animals under physiologically relevant conditions. Before this study began, Engelward and her students engineered a mouse that allows them to track DNA mutations. Whenever a certain class of mutations occurs in the pancreas, the cell with the mutation fluoresces, allowing it to be seen with a standard microscope. Using this model for mutation detection, researchers induced inflammation in the pancreas and found that the amount of mutation depends on the timing of bouts of inflammation. When the inflammation occurred in short bursts a week or more apart, the researchers did not see any evidence of increased mutations. However, when the bouts occurred within a few days of each other, there was a significant increase in mutations. Further studies in the pancreas revealed that inflammation-provoked cell division does not start happening until several days after inflammation begins, while most of the DNA damage occurs right away. This DNA damage is repaired fairly easily without causing potentially cancerous mutations. However, if another bout of inflammation induces DNA damage at a time when cells are dividing due to the previous bout of inflammation, many mutations appear. This delay between DNA damage and cell division likely serves as a defense mechanism against mutations from acute bouts of inflammation. However, this defense breaks down when the inflammation occurs soon after the original flare-up or is sustained for a long time. “That means the model that’s been around for a long time is accurate, because you do get synergy between cell division and inflammation-induced DNA damage, but in these studies there was only a mutation risk if there is chronic or repeated inflammatory responses,” Engelward says. The effect in humans could be even more dramatic because many people suffer from chronic inflammation that goes on for years, she says. In a second set of experiments, the researchers studied the effects of exposure to an alkylating agent similar to those found in food, cosmetics, environmental pollutants, and certain cancer chemotherapy drugs. Alkylating agents cause damage to DNA, which cells are usually able to repair. However, if too much occurs, alkylated DNA bases lead to mutations that can cause a cell to become cancerous. Engelward and Kiraly suspected that alkylation-induced mutations would accumulate at a much faster rate in inflamed tissue, where cells are dividing rapidly, than in healthy tissue. This turned out to be exactly what happened. “These findings suggest that chronic inflammation potentially results in increased DNA damage and proliferation that together can conspire to increase the chance of cancer formation,” says Peter McKinnon, a professor of genetics and tumor cell biology at St. Jude Children’s Research Hospital who was not part of the research team. This discovery suggests that people with chronic inflammatory diseases, which are common, may be more sensitive to carcinogens in the air, food and water. Also, developing fetuses and very young children may also be more sensitive to these agents because their cells are dividing more rapidly, Engelward says. Another new study from the Engelward laboratory, published in the journal Carcinogenesis, shows that animals treated with a growth-inducing hormone are more susceptible to damage-induced mutations. “A lot of what we do for safety evaluation is based on adults, and not … during development. The conditions are really very different. Our findings are consistent with studies done in the MIT laboratories of John Essigmann and Gerald Wogan showing that there is a critical ‘window of susceptibility’ to DNA damage-induced mutations during development. I’m hoping that studies like these will help to call attention to the importance of analyzing mutation susceptibility during development,” Engelward says. The findings could also have implications for cancer treatment, because many chemotherapy drugs work by damaging DNA. Cancer cells divide frequently, making them more susceptible to mutations, which can help them to survive chemotherapy because some of those mutations confer drug resistance. The new results offer support to the idea that increasing the toxicity of DNA-damaging chemotherapy by novel drug combinations can make cancer chemotherapy more effective by suppressing evolution of the tumor, Engelward says. While this study focused on the pancreas, Engelward’s lab now investigates mutations in the colon and the lung using a new version of the engineered mice described in another recent paper in PLoS Genetics. Using the newly developed mice it is now possible to study mutations in virtually any tissue and to learn about how infectious diseases impact mutations. “Our fundamental advances in our understanding of inflammation and mutations form the basis for our ongoing studies of inflammation of the lung caused by infections, such as influenza and S. pneumoniae,” says Engelward. These studies were supported by the National Institute of Environmental Health Sciences with additional support from the Singapore-MIT Alliance for Research and Technology and the Austrian Academy of Sciences. Be the first to comment on "A Link between Inflammation and Cancer"